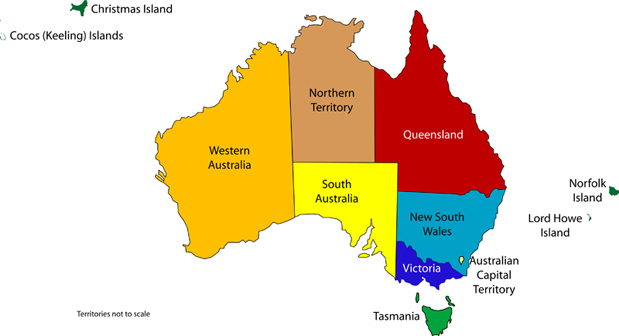 The Commonwealth of Australia consists of six states that were originally separate colonies of the United Kingdom. The Constitution provides for the Federal Government to create Territories, some of which have responsible self-government. In addition, some states have island dependencies, the most significant of which are Lord Howe Island (NSW) and Macquarie Island (Tasmania). The state flags consist of the British Blue Ensign, each with a badge that represents the state. This flag pattern was introduced in 1865, when the British Admiralty determined that vessels maintained by the colonies would each use a flag bearing its seal or a badge. In 1868 the use of these badges was extended to the centre of the Union Jack, for use by the Colonial Governor. By 1875 all of the Australian states (then colonies) had adopted badges for use on the blue ensign and the Governor's flag, though several were subsequently changed. Gradually the flags came to be used on land by the state governments and from the 1970s their wider public use as a state flag was encouraged. As the territories were never separate British colonies, they have progressively adopted flags that are not based on the colonial pattern. Several territories have no flag: the Australian National Flag is used for the Australian Antarctic Territory, Jervis Bay Territory, Ashmore and Cartier Islands, Coral Sea Islands Territory and Heard and McDonald Islands. New South Wales - The badge was adopted on 18 February 1876. It consists of a red St. George's Cross bearing four 8-pointed golden stars and a lion passant guardant. There is no contemporary explanation of the design but it was similar to an unofficial coat of arms that dates from 1821 and included the cross and stars. The lion was likely to signify the vice-regal authority of the Governor. Victoria - The current Victorian state flag dates from 30 November 1877, though it has undergone two changes in the type of crown - in 1901 from an Imperial Crown to a Tudor Crown and in 1953 to St. Edward's Crown. The Southern Cross uses different numbers of points on the stars to indicate their relative brightness - 8,7,7,6 and 5. Queensland - The badge was selected by Governor William Cairns and was officially adopted on 29 November 1876. It consists of a blue Maltese Cross bearing a Crown in the centre. The drawing of the badge has changed over time - new crowns in 1901 and 1953, the size and shape of the cross enlarged and the shade of blue changed from the original dark blue. There is no contemporary explanation of the design but it is evident from the other designs considered that the badge was intended to represent the vice-regal authority of the Governor or to represent Queen Victoria for whom the colony had been named. South Australia - At Federation, only South Australia decided to obtain a new flag badge. Described as an Australian piping shrike, the bird is actually a white-backed magpie. The heraldic display of the wings has been attributed to the arms of Prussia. The yellow disc was intended to refer to a golden rising sun of Federation. The new badge was officially adopted on 14 January 1904. Tasmania - Adopted on 29 November 1875, the Tasmanian badge consists of a red lion passant. There appears to have been no attempt for the badge to be emblematic of the colony. The lion was originally intended to be used only on the flag of the Governor. A distinctive design for local shipping, featuring a Southern Cross, was abandoned as it did not comply with the British Admiralty pattern for colonial flags. Western Australia - The black swan recalls the origin of the colony as the Swan River Settlement. Adopted on 3 January 1870 by Governor Frederick Weld, the swan originally faced away from the hoist. The direction was changed on 10 November 1953. If the change of direction is ignored, then the Western Australian flag is the oldest state flag. Northern Territory - When self-government was granted on 1 July 1978, the Northern Territory adopted a flag. The flag is divided into two panels - black at the hoist equal to one third the length of the flag and the other in ochre. The main emblem is a stylisation of Sturt's Desert Rose, and uses seven petals around a seven-pointed black star, evoking the Commonwealth Star. Note that the Southern Cross uses the Victorian configuration of stars, reflecting its design by Robert Ingpen, a Victorian artist. Australian Capital Territory - The ACT flag was adopted on 25 March 1993 based on a design by Mr Ivo Ostyn, a local artist. The flag is divided into two panels - blue at the hoist and yellow, the heraldic colours of the Commonwealth of Australia. The main emblem is a simplified version of the coat of arms of the city of Canberra, which had been granted in 1928. The shield contains a triple-towered castle and a crown above a sword of Justice crossed with the Parliamentary mace. A small white rose alludes to the 1927 opening of the old Parliament House by the then Duke of York. wider white panel, upon which is a representation of the Norfolk Island pine tree. 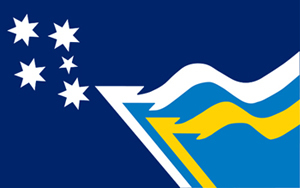 Christmas Island - A Federal territory, local services are provided by the Shire of Christmas Island, which has officially adopted a flag unofficially in use since 1986. The flag was designed by Tony Couch, who won a public competition. The blue and green diagonal panels represent the sea and the island's vegetation, a small map of which is included in the centre. The main emblem is a Golden Bosun Bird, a sub-species of white-tailed tropicbird. Cocos (Keeling) Islands - A Federal territory under the control of an Administrator, who is based on Christmas Island. A local flag has been unofficially in use since 2003. The crescent acknowledges that a majority of the small population are Sunni Muslims, descendents of Malays originally brought to the island to provide labour on copra plantations. Lord Howe Island - An unofficial flag for the island was designed by John Vaughan, a Sydney vexillologist and first flown in November 1998. The central badge represents the island's topography, whilst the field of the flag alludes to the pre-1801 Union Jack. Lord Howe Island is administered by the Lord Howe Island Board on behalf of the NSW Government.